What are some of the peak experiences in your life? Mine have often revolved around live music, preferably performed outdoors on a warm summer’s eve, commencing with the setting sun, and stirring my soul as the stars come out. And to blend a bit of the bubbly and fine cuisine into the mix… sheer perfection. 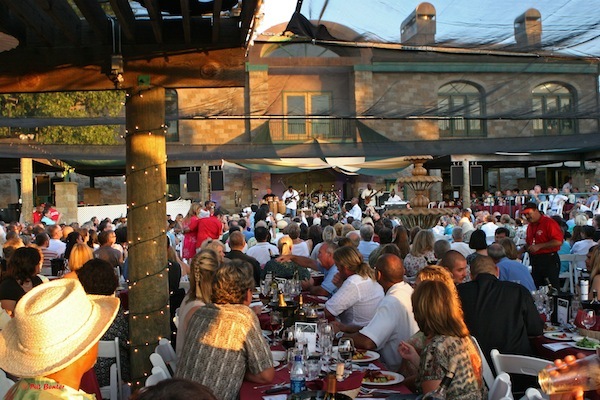 While there are several San Diego venues that deliver big name entertainment, consider a more heady choice: travel up the Interstate 15 to the glorious Temecula wine country for Thornton Winery’s 23rd annual Champagne Jazz Series. Among this summer’s lineup are nationally renowned contemporary jazz artists Chris Botti, Herb Alpert, Dave Koz and George Benson, many returning to entertain in the intimate setting on Thornton’s Mediterranean “Fountain Terrace.” Exit Rancho California Road off I-15 and drive eight miles. As you cross Butterfield Stage Road, you’ll arrive into a picture-perfect region of rolling hills, covered with vineyards — green, lush and beckoning in the summer season. 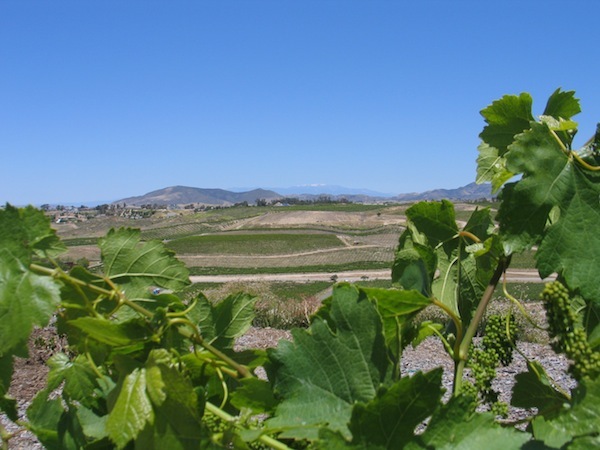 Most wineries are on Rancho California Road; there’s also the nearby “De Portola Wine Trail.” Vineyards got underway in earnest in the Temecula Valley in 1974 with the opening of Callaway Winery, but only in the past decade has the area assumed its rightful place as a true wine country. Today there are 34 wineries and 25 vineyards and new venues. New venues come on board each year and existing wineries expand (watch for the opening of Ponte Winery’s 60-room hotel next spring). The valley’s South Coast Winery and Spa was named Best California Winery for two consecutive years, 2008 and 2009, by the California State Fair Wine Competition, causing heart palpitations, I’m sure, throughout the Napa-Sonoma region. The iconic Thornton Winery, an elegant French-style chateau perched on a hill with views of the vineyards beyond, was established in 1988. Its Café Champagne is one of the top restaurants in the region, garnering gold awards for 11 straight years for its “contemporary fusion” cuisine. It’s also the only restaurant in the Inland Empire to receive the Golden Bacchus award for its wine list from the Southern California Restaurant Writers Association. The winery is owned by La Jollans John and Sally Thornton (think UCSD’s Thornton Hospital as one prime example of their largesse). Son Steve Thornton is the winery president. Thornton first made its name for award-winning sparkling wine, known as Thornton champagne, but it has expanded its reputation with new varietals, securing gold awards for its 2005 sangiovese rose and 2004 merlot reserve, among hundreds of bronze, silver and gold awards garnered over the past decade. Last September, the winery brought in winemaker David Vergari, who plans to release new varietals including zinfandel, barbera, petite sirah and a Bordeaux blend. Champagne Jazz Series general admission tickets are available in rows of concert-style seats and a limited number of small tables for four on a first-come, first-served basis. All tickets include a commemorative champagne glass. Of course, you’ll want to fill that glass with something, and you can choose from the winery’s offerings. At the Champagne Jazz Grill, set up for the concerts, you can purchase dinner (say, salmon or ribs with sides of fruit or pasta salad) for $16 to $22; prices and menus vary. If you choose this option, you’ll need to balance your plate on your lap, so take advantage of the seat availability one hour prior to showtime. Wilson Creek Winery’s Sunset in the Vines jazz series featuring Warren Hill, July 23; Paul “Shilts” Weimar, Aug. 20 and Jeff Golub, Sept. 17. Keyways Winery’s Wine Down Fridays dinners and concerts, $25, non-members; $15, members, on the second and fourth Fridays of each month. Oak Mountain Winery features free live music every Saturday and Sunday in the pavilion, 1-5 p.m. Cougar Winery features free classic rock at its indoor barrel room from 2-5 p.m. Saturdays and Sundays. Mount Palomar Winery offers “Bistro Fridays” at Shorty’s bistro, with classic rock, blues and jazz artists entertaining dinner guests from 6:30-9:30 p.m. You’ll be glad to know that lodging choices have kept pace with the increasingly sophisticated wineries. Stay overnight and enjoy an early morning hot-air balloon ride, a wine-country shuttle tour and picnic, a spa treatment… or maybe just a little more wine tasting. Inn at Churon Winery 19 “Vineyard View” rooms, 3 oversized suites, 2 deluxe suites from $180/night. All have in-room gas-burning fireplaces, French doors opening onto private terraces or balconies, down blanket bedding, gourmet breakfast, evening wine hour. (951) 694-9070 or www.innatchuronwinery.com. $130-$180, no minimum stay. (877) 676-7047 or www.lomavistabb.com.